Bars of dairy-free, keto matcha protein ice cream drizzled with keto dark chocolate. Completely vegan, gluten-free, nut-free, sugar-free, and keto. Bursting with healthy fats for your fat fueled, keto life. Keto ice cream! I’m literally writing this listening to the song Ice Cream by Jacob Plant dancing at my standup work desk. I’m channeling the keto ice cream energy on this one. Word. So many people have told me that they find it difficult to eat when the weather gets really hot. I don’t have this problem (like, at all) but I feel you. Not so much from a hunger perspective, but when it’s a scorcher of a day, the last thing I want to do is be cooped up in my kitchen. So I’ve been thinking of ways to live a fat fueled, keto life with as little keto food prep as possible – simple keto treats and good keto eats with minimal cooking + maximum nutrients. 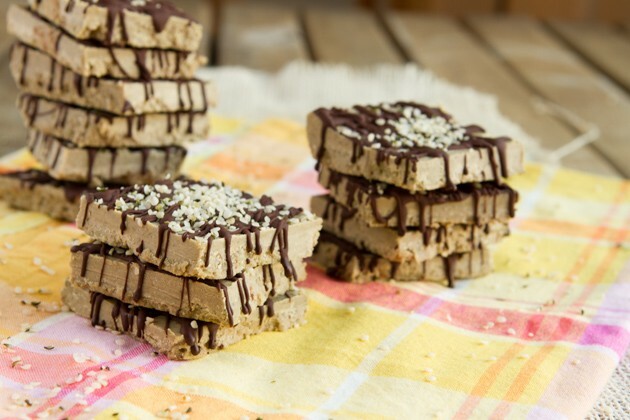 Enter the keto protein ice cream bar! These keto bars took me 15 minutes to whip up, they’re great for afternoon keto snack action (think: frozen keto fat bomb avec protein!) similar to my Keto Fat Bomb Ice Cream but this is a less messy alternative. I use protein powder as a convenient way to fuel up on the go – when I’m on the run, too lazy to create something epic, or in the mood for a chilled keto treat to cap off my afternoon. 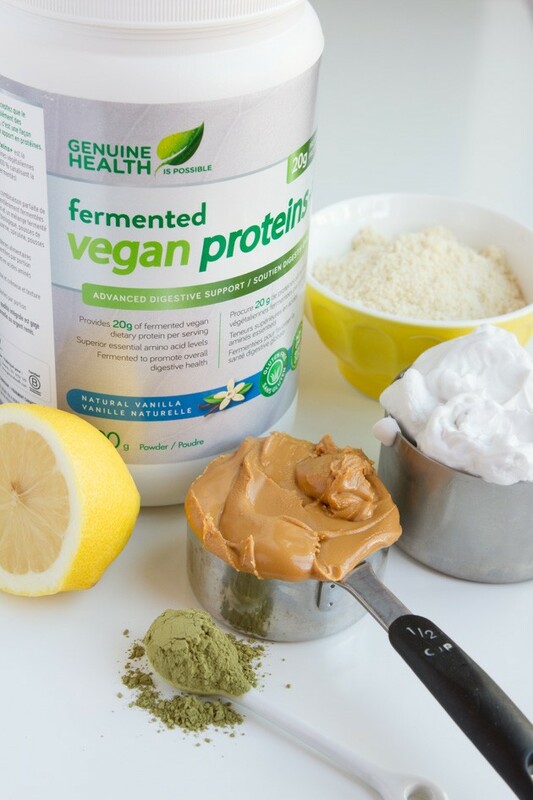 As you know, I’m in love with Genuine Health fermented vegan proteins+ because it’s just about the only protein powder that doesn’t reek havoc on my digestive system. It’s silky smooth… and delicious! 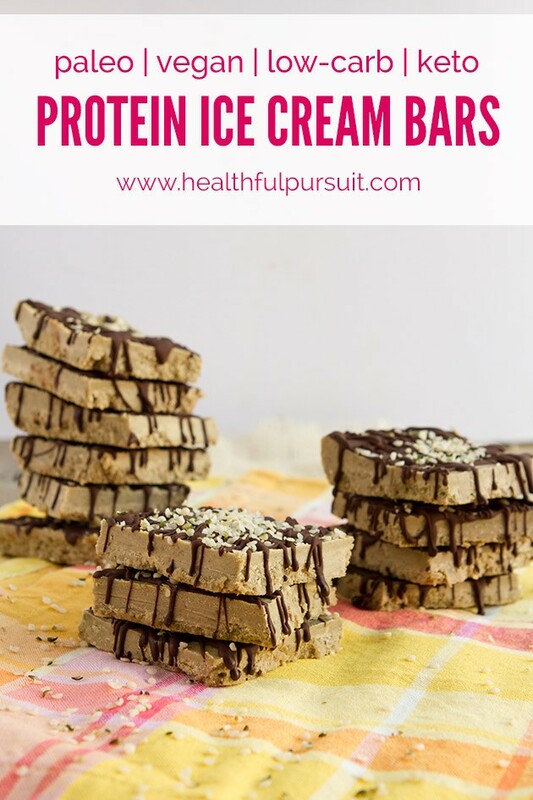 Sure, you could add the protein powder to a shaker cup and move on with life, but that’s not nearly as fun as feasting on these dairy-free, keto ice cream bars. 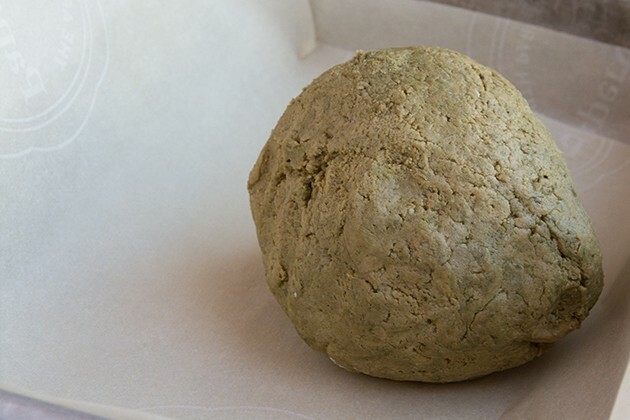 The keto recipe is a simple combination of coconut cream and Genuine Health fermented vegan proteins+ made into a dough and pressed into a pan. 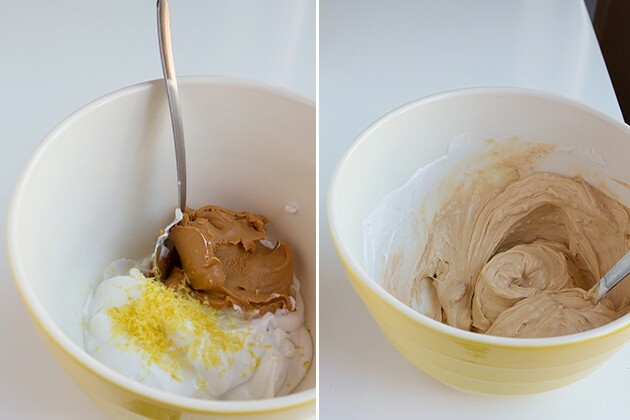 They’re no bake and you don’t need an ice cream maker to feast on this vegan, keto ice cream. 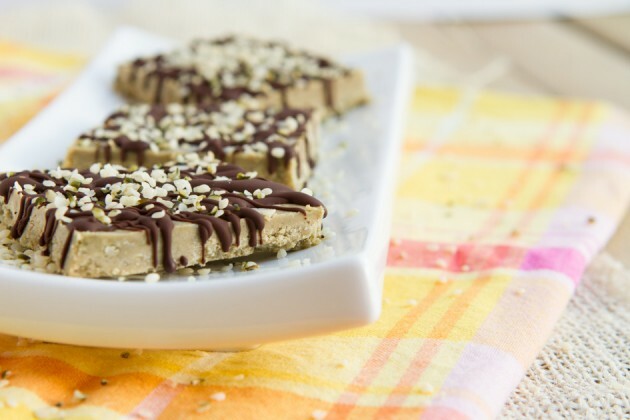 Bars of dairy-free, keto matcha protein ice cream drizzled with dark chocolate. Completely vegan, gluten-free, sugar-free, and keto. To remove the cream from the coconut milk, place can in the fridge for at least 24 hours (I like to keep a couple of cans in the fridge for quick access). Flip upside down, open with a can opener drain out the liquid, leaving you with the coconut cream. Add wet ingredients to a large bowl. Stir to mix. Set aside. Add dry ingredients to a small bowl. Whisk to combine fully. Drop into the wet mixture and stir with a large spoon until fully incorporated. The mixture should be like dough, you may have to mix with your hands. Line a 13x9 pan with parchment paper draping from all sides. Press the dough into the pan and spread evenly. Place in the freezer for 2 hours. Remove from the freezer and cut into squares. 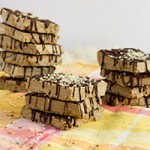 Drizzle each individual with melted chocolate and sprinkle with hemp hearts. Serve immediately, or right from the freezer. Keep Nut-free: use the sunflower seed butter and hemp heart recommendations above. Stevia: if you don’t like stevia, feel free to use your favorite sweetener here. Vanilla Genuine Health fermented vegan proteins+ is lightly sweetened with stevia, so there’s a bit of sweetness coming from it already. Add all of your wet keto ingredients to a large bowl and give it a good stir. It’ll get creamy and gorgeous. I wanted to just jump in at this point! 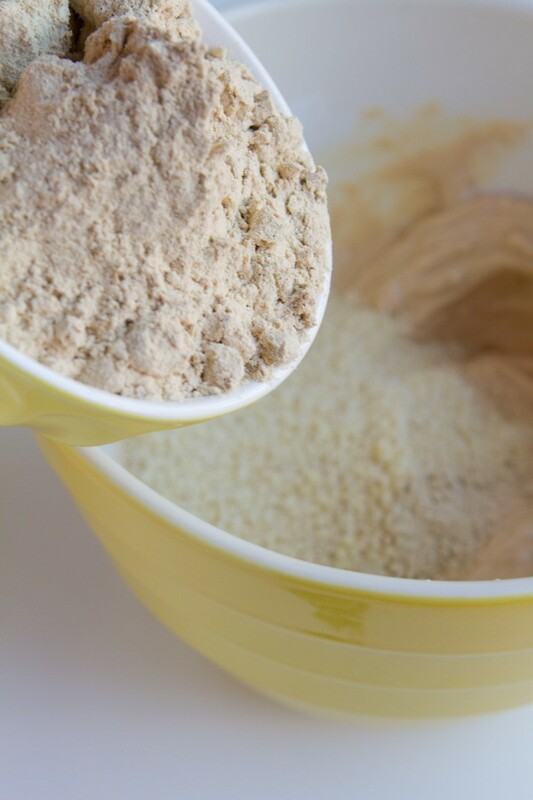 Once the dry ingredients are mixed in a little bowl, add them to the wet. You’ll notice that the matcha powder wasn’t added to my dry ingredients… because I needed to taste the flavor bit by bit until I reached the right level. I liked the recipe at 2 tablespoons of matcha powder. The keto mixture is pretty thick, like dough! I bet you could make balls out of this recipe, too! Ah, keto ice cream balls! 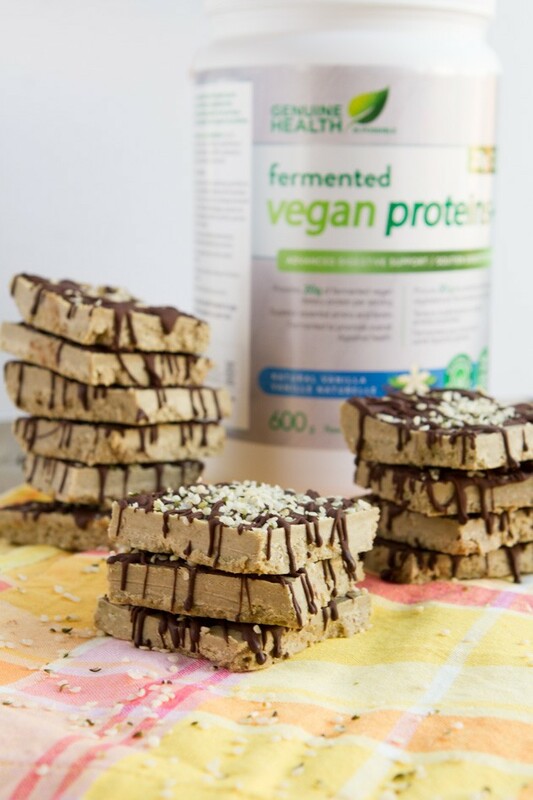 Have you tried some of my keto recipes using Genuine Health fermented vegan proteins+? Of all the ones I’ve made so far, these No Sugar Greens Truffles are still my favorite. Which are your favorites?